I’ve been trying my hand at some of the more ‘healthy’ options lately. Reducing sugar, carbs or oil in your diet may seem like an easy change, but it’s more difficult than you realise to keep a balanced diet. By no means am I ‘on a diet’, however after returning from my trip I felt like I hadn’t been living as healthy a lifestyle (due to 5* hotels so not complaining!) as I’d like. Every so often, my Mum will link me to articles on the internet or even go to far to cut stuff out of the weekend newspaper to give to me when I go home for the weekend. It’s cute and the recipes always look amazing, but some of them look way too difficult. This one was difficult though. From a section of a weekend magazine called “Lifestyle & Weekend”, I’m pretty sure it was the weekend magazine from the Courier Mail however can’t guarantee! Anyway, there was a recipe for Quinoa Bircher with apple and pear compote, coconut yoghurt and toasted almonds. 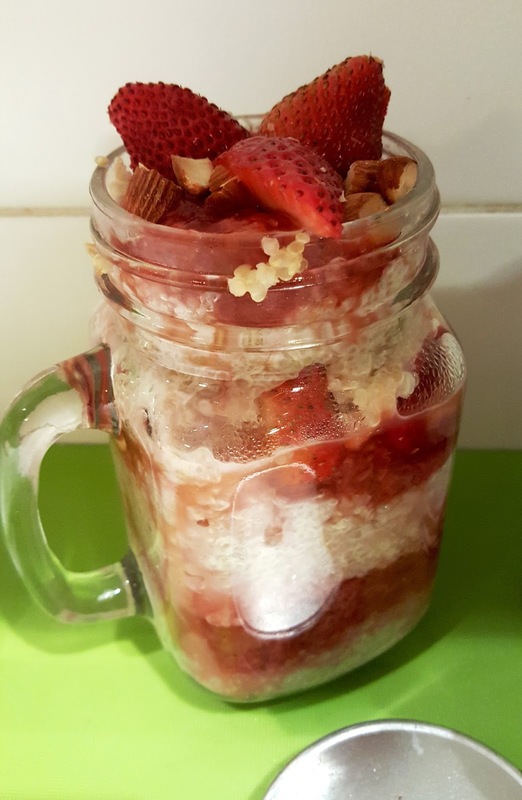 The recipe said that you could change the apple and pear compote for strawberries, and having just been to the farmers markets and stocked up on berries, this was the perfect recipe! These are the ingredients on the recipe, however I can’t claim to have followed it exactly because I decided to make it at 11pm at night (ready for breakfast the next day!) and my uni student pantry doesn’t include cinnamon sticks (let alone ground cinnamon) or vanilla bean paste. If you’re like me and buy stuff as you need it, you may need to go shopping. Quinoa is very easy to cook. Rinse it first to ensure the nasty chemicals are gone, but don’t lose half of it down the sink like I always seem to! Then pour it into a saucepan with the same amount of water that you’d usually use to cook rice. Don’t stir. When it’s cooked, the water will have been absorbed into the quinoa and you shouldn’t need to drain it. Add the coconut milk to the quinoa and set aside to cool. For the fruit compote, you literally add all of these ingredients into a saucepan and mix. Remember to chop your fruit first! As the fruit begins to break down and the mixture boils, be careful not to burn any of your ingredients to the bottom of the pot. I used lemon juice here instead of the zest of two lemons. I also used vanilla essence and regular white sugar. The compote tasted awesome and it’s up to you how thick you want it. Take off the stove when you’re left with the desired consistency (maybe a little thicker than jam). Whilst this is happening, toast your almonds but definitely don’t forget about them! 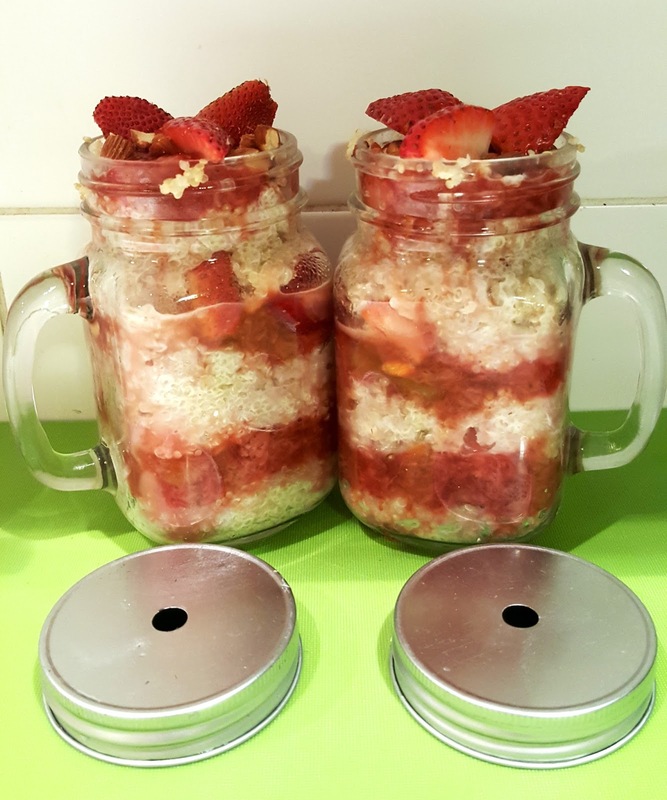 Then, get jars or bowls and alternate layers of the quinoa and compote. Top with chopped, toasted almonds and yoghurt to serve. This recipe was relatively easy to do and perfect for a cooking novice like me. I wish I’d had cinnamon because I feel like it really would have completed the taste because the quinoa was a little bit bland without it. If you’re looking for something a little sweeter (the coconut milk doesn’t do much to sweeten it), try adding honey to the quinoa mix before layering to keep it nice and healthy but great for those with a sweet tooth! I’m also a big fan of quinoa in savoury quinoa salad (with olive oil/paprika dressing and olives, cherry tomatoes, feta and parsley) so it was strange to be eating it as a breakfast food! Overall though it made a great change from porridge or cereal and I was very tempted to eat it hot!